Ever since Don Imus was fired–even after repeated apologies–the PC police are out for blood. They got a little taste with the severe Imus overreaction. And now, they hunger for more. Yes, unfortunately, out-of-proportion outrage is not just a fad. It’s becoming a way of life Just ask Don and Jenny Greenwell. They’re candidates in Tuesday’s election for school board in the swanky Detroit suburb of Bloomfield Hills. That school district–amidst Michigan’s ultra-depressed, 50th-in-the-nation economy–wants to raise and spend $121 million dollars to tear down two relatively modern high schools and build anew. It’s an incredible waste of tax dollars. But, now, the Greenwells–a Christian couple who oppose this wasteful spending–are being called “anti-Semitic,” and will probably lose amidst the absurd, undue furor. Absurd: Does This Look “Anti-Semitic” to You? 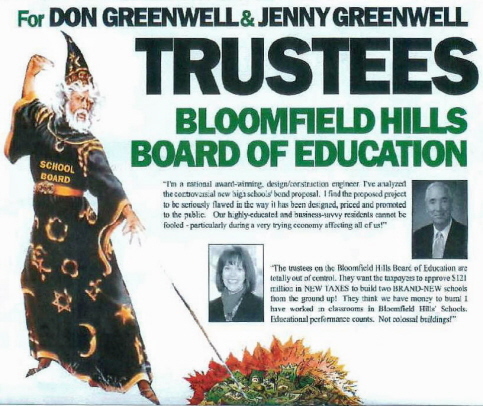 The Greenwells sent out a campaign flyer depicting a wizard burning a pile of money. As an observant Jew, the picture looks quite innocuous to me. But to a large group of shrieking, whining liberal Jews, the Greenwells are raving, seething anti-Semites who want to lock all Jews up in concentration camps tomorrow. Why? Well, hundreds of liberal Jews and “interfaith” clergy (consisting of leftist rabbis and their “friendly” local imams and Israel-boycotting churches) are declaring the wizard to be an anti-Semitic drawing. So is the liberal Anti-Defamation League. They say the designs on his robe amidst crescent moons look like Jewish Stars–the Stars of David. And, they claim, the wizard looks like Moses. How do they know what Moses looked like? Well, I’m sure they all have photographic memories of that time they accompanied him on that hike to Mt. Sinai. And maybe one of them kept his/her digital camera card from that time the Red Sea parted and the bush burned. Regardless, the Greenwells have apologized over and over and over again. They apologized on three local newscasts. They apologized in several local newspapers. They apologized on their blog/website. They apologized at a luncheon for the local Hadassah–you know, the same group of liberal Jewish women who had no qualms about honoring FoS (Friend of Suha Arafat) Hillary Clinton at their national convention. I don’t agree with the premise that it’s a Star of David because it has little curly-cues on the end of each point. It came from stock art from a professional artist. You can always find someone looking for something not intended. Amen to that. And that’s exactly what’s going on here. I’m embarrassed by this absurd, misplaced outrage, which looks like the Jewish, white version of Al Sharpton, Jesse Jackson, and their followers. But despite the Greenwells’ Imus-to-Sharpton-esque groveling, the Greenwells’ repeated apologies are not enough. The Greenwells’ gazillionth apologies, yesterday, at a town meeting of 150 angry liberal Jews (and Muslims–must have Muslims present to really turn the knife here), were booed. And none of the conniptive liberal Jews–still whining after days of TV and newspapers stories–will forgive them. None of the so-called rabbis either. Even if it was just a mistake, I think we need to be smarter than that. I think everyone “needs to be smarter than” the knee-jerk, overreactive Rabbi who apparently forgot Jewish precepts commanding the acceptance of an apology. he told the Detroit Free Press. parent Rena Kirshenbaum told the Newsistan. Nope. We can’t forgive this couple, which wants to stop rampant spending when–these days–even wealthy Bloomfield Hills schools can’t afford it. The Greenwells cannot be forgiven, unlike feminis uber-liberalis Hillary Clinton (whom many of these people are supporting for President). These fellow co-religionists (and I use that noun very loosely, since they’ve replaced the Jewish religion with a mob lynching) of mine want the Greenwells out of the race. They want the $121 wasteful bond proposal the Greenwells rightfully oppose to pass. And they have no problem trumping up the anti-Semitism card to get there. Never mind that the Jewish stars were not a symbol picked by the Jews to represent us. And never mind that wizards often wore hexagrams, which are practically identical and are a sign of wizardry and witchcraft. Contrast Bloomfield Hills’ intolerant treatment of the Greenwells to the way these same liberal Jews embrace extremist Muslims throughout their community. The Jewish star appeared on hate signs all last summer in protests drawing over 10,000 local Muslims in support of Hezbollah. In that case, there is no mistake the malignant reason the Jewish star was featured on the signs, as were swastikas. Yet, the same Jews were quick to embrace these same Muslims just weeks after the Israel-Hezbollah war was over. All is forgotten. All is forgiven. Yet, unlike the Greenwells, the Muslims never sought forgiveness, they never apologized. Unlike the Greenwells who hired someone to make their campaign literature, the Muslims in town made their signs and did so purposely and with a vengeance. Yet, no peeps from local Jewish liberals living in the area, like Sharona Shapiro–the calorically-gifted verbal Monica Lewinsky to radical Islam. She wouldn’t wanna miss that falafel she regularly eats with them. A month ago, I watched Shapiro and over a hundred liberal Jewish women from the area crowd into the Unity Center Mosque of Bloomfield Hills and gush and cry over the Muslim women at this intolerant mosque. When I raised questions over why the mosque and its K-12 school library featured the writings of Anti-Semitic, anti-American Muslim scholars Sayed Qutob (Osama Bin Laden’s religious guru) and Yusuf Al-Qaradawi (spiritual leader of the Muslim Brotherhood), I was asked to leave by this Klueless Klub of Kumbaya-ettes. I was told that we must “understand” each other so we can’t discuss these kinds of things. If only the Greenwells were named Mohammed and Hamida, the liberal Jewish conniptions over their harmless campaign flyer would never have occurred. But, unfortunately, that’s the state of affairs in America, today. And it’s emblematic of why we’ll never get upset over terrorist attacks in America again. We’re so sensitive to the minor comments of a radio talk show host no-one listened too; We’re so outraged about a benign campaign flyer and won’t accept the glut of apologies from its circulators. Yet, we rush faster than all get-out to embrace those who really wish us harm. We hurry to overlook their very open and obvious wishes to kill us. And we wonder how the Holocaust happened. I think it’s quite clear. We embrace our enemies and make unnecessary enemies out of our friends over foolish things. Sadly, while these liberal Jews couldn’t be farther from real, traditional Judaism, they are the perpetual face of my religion in the local–and national–media. I feel as if I’m the only local Jew (besides my family) that isn’t bothered by this campaign flyer. It’s not anti-Semitic. Not even close. It seems also that I’m the only local resident–regardless of religion–that is disgusted at the way a cranky, whiny group of liberals is exercised over the equivalent of an ant going to the bathroom. Everyone else is piling onto the group think wagon, out to Imus-ize the world. The outrage here is not the innocent campaign flyer. It’s the way the “outraged” PC police overreacted over nothing and refuse to move on. And that this innocent couple has been very unfairly dragged through the mud and branded with a very powerful, marginalizing negative epithet. Those who think they are combatting anti-Semitism with their shrill attacks on the Greenwells are sadly mistaken. They are breeding it. Your crazy Jewish Neighbors don’t know what they’re talking about re: “Jewish Star” on the Merlin picture. Just because the symbol on the wizard’s robe looks a lot like a star of David doesn’t mean it IS a star of David. I submit that only the graphic artist who created this wizard knows for sure whether that symbol was or wasn’t intended to be a star of David. To the best of my knowledge, we haven’t heard from him or her yet. And last time I checked, liberal Jews, like the rest of us, lacked the ability to read a graphic artist’s mind. Finally, even if the graphic artist in question were to pop up and say “yes, I meant it to be a star of David,” it would be very unfair to impute that intent to the Greenwells. FIRST—the Reich-wing PC Gestapo…i.e., Mr Bill [O’Reilly] and his minions quickly lynched Rosie in the aftermath…even though THAT was something in the works months before the nappy head hos made the scene…..
YOU should know more than me that this goes back to the old blood libel—and it SHOULD make you take pause and wonder WHY Jews are still identified with witchcraft TODAY. Just watched “Jesus Christ Superstar” on Sundance the other day, NOTICING the latently BLANTANT anti-Semitic theme for the first time…but 30-odds years ago i was more into the MUSIC that the politricks…..
Hmmm……..you had me curious for a second. To come to think of it, Voldemort seems to have a ring to his name. Somebody sue J.K. Rowling for her anti-semetic propaganda.Perhaps a boycott on her Harry Potter series should be issued as well. These paranoid whinning jewish liberal yahoos accuse the Greenwell’s for the bigotry and comtempt they have towards religious jews such as myself.According to them, a flyer of merlin garbed in a robe ornamented with magin davids ( proudly I wear a necklace of such) is seen to be far more malevolent and omnious than a group of bloodthirsty radical jihadists threatening Israel(and jews at that matter) with another nuclear holocaust in broad daylight. I guess you have to be white in order to pass as an anti-semite in their profile,even if its only a benign poster. Everyone else can pass. Lighten up! Do these uber sensitive and over the top outraged individuals ever stop to think that by their very actions they are in fact causing the things that they are supposedly raging against? You’d think that Americans are nothing more then human hating bigots who spend all day thinking of ways to enrage others. I’m a practicing Catholic (really old school- my father came from Poland so need I say more?) and in my opinion, this piece simply illustrates the cognitive dissonance and self-loathing that the extreme liberal influence has on religion- call them the fifth column of the atheist movement if you will. What I mean by this, is for example, nary a peep gets issued from the ‘ligious – left (how’s that for a turnabout of a phrase?) when a crucifix is displayed dipped in feces as “art”, but they will go to the ends of the earth to find offense in something like this campaign poster. It’s become obvious in my own church that the influence of liberally inspired politics is something debilitating in many ways to the integrity and practices of the faith. I’m sorry to see that it’s becoming a factor in Judaism as well. I for one have never associated “witch craft” with anything having to do with Jews or Judaism. I’ve always seen it as being druidic, arthurian and pagan. Had I seen that poster without any up-front preparation, I’d have seen absolutely nothing in it except it’s intent- magically burning money. And for what it’s worth, EminemsRevenge, the movie Jesus Christ Superstar is a hollyweird production. I’d look more to any semblence of anti-semitism in its presentation coming from the politics of the producers than from the faith that it represents. My Dad taught me to respect Judaism- he always said that if if it wasnt’ for Judaism, there would be no Christianity- that we shared the same Deity, the same moral values and common beliefs. He lived through the times of the Holocaust in central Europe and experienced some of the same “treatment” because he was a “Polak”..
It’s sickening to me that the libs preach benefit of the doubt when it comes to their own, but when it comes to anyone else apologizing for offense against what they believe, there is no benefit of the doubt given. Loony libs wouldn’t know what giving someone the benefit of the doubt really means or even how to accept an apology. Of course, they don’t know how to give an apology either lol. When Jews crucify Christians for a make-believe insult, but cozy up to Muslims who’s un-holy book calls Jews apes and swine, a person who lives by linear logic can only throw up his hands. How can one even begin to address such irrationality? Debbie, it’s like that eveywhere. Jewish political organizations that aren’t specifically Orthodox or Zionist are generally a collection of ignorant, left wing, craven moral midgets who treat their Judaism like a red headed stepchild. I think they’re the modern day version of the Jews who worshipped the golden calf. The ad may have been a “faux pas”, but the savage reaction is just a miniature version of the Imus fiasco – cynical politicians using a minor incident to peddle their agenda while promoting themselves as the essence of “tolerance”. Meanwhile the hypocrisy is nauseating as the media consistently whitewashes Arab and Muslim anti-semitism – left-wing anti-semitism in general, for that matter. YOU ARE A GENIUS. I ALWAYS LOVE YOUR POEMS. BRILLIANT. largest congregations in North America with lb. for lb. maybe the lowest level of religious observance.My non-religious aunt and uncle gave it up after years of shifts of around an hour a year for High Holiday services(so 2 hours a year).Several years ago,I led services for my grandfather;one of the several “rabbi’s” from Temple Israel came over to shmooz after services.A few years later, a couple of women came by without one of their “rabbi’s” to say Kaddish for my aunt’s mother.So obviously,this makes them mavens on Jew-hatred. Ilooked at the cartoon and just figred it was another one of those crazy muslims being depicted as smiting the infidel. By the way, where can I get one of those cute little batman silk belts. Pretty cute! I find it rather disturbing that a local Rabbi could not forgive someone who apologized for a minor accident that had no apparent malice. The six-pointed star (or two overlaid triangles) is just one of those natural symbols that’s bound to occur in various unrelated contexts. For example, it’s part of the Great Seal of the United States. Look on the back of any one-dollar bill and you’ll see the Great Seal, with the thirteen stars over the eagle’s head arranged in the form of a six-pointed star. It’s just ridiculous to assume that symbol necessarily has something to do with Jewishness. “art” is made by liberals to assuage their anomie. Propanganda is made by fanatic right wingers, only a propagandist couldve made this poster, never an “artist”. Ever read the closing of the American Mind by another propagandist Jew? hmmm. I was just reading about Grasci and how he believed that if you could control the arts the party would install itself. We are now entering the “liberals only” era. And it will be ushered in by the same elite rich Jews that helped found the SS and sat around in Berlin yucking it up while giving Hitler the socialist half of his b.s. It scares me that as a Birmingham Seaholm Grad that actually lived in germany 76-79 I know more about Jews than they themselves do. These are the same jews that marched silently to the words “Einstiegen auf der Lastwagen”. I worked a red cross blooddrive in Southfield Synagogue and the whole time I sat there giviing milk and cookies that was a guy that wouldnt leave demanding I let him campaign for gun control. I kept asking him how it was possible for a jewish “man” to even entertain allowing the government to control his guns. Just goes to show you that there are as many different types of jews as there are numbers of jews, but we’re committing the same suicide as the Weimar Republic. After watching the republican debate I think its going to be Thompson/Duncan or we’re in for a huge shitstorm. Still begs the question, will everyone be reading, writing and doing arithmetic in English? Seriously, that’s no coincidence. I’m no liberal crybaby, but there’s really no reason for that being there – I mean, Jimmy Page in “The song remains the same” movie never used any stars o’ david on his wizard outfit, and he was a wizard! It’s a CRAP image designed to tweak the jew’s messin’ bout hackles…..dance around it all you want. If it’s so great, paint it on your car and drive around all year…….yeah, thought so….